President Obama gave his final State of the Union address tonight, pointing out the auto industry having its best year ever while looking to a future where our reliance on fossil fuels no longer limits us. 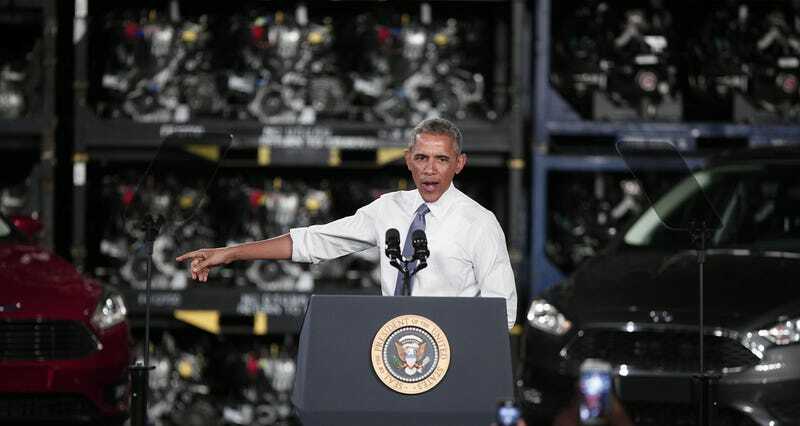 Obama didn’t linger very long on the future of the auto industry, which was quietly advertised prior to tonight’s speech. Instead he subtly hinted at advancing alternatives to fossil fuels, like hybrid electric and fully electric vehicles, to avoid forcing the U.S. into a desperate situation over foreign oil, and continuing to innovate and develop the clean energies and practices of our future. Seven years ago, we made the single biggest investment in clean energy in our history. Here are the results. In fields from Iowa to Texas, wind power is now cheaper than dirtier, conventional power. On rooftops from Arizona to New York, solar is saving Americans tens of millions of dollars a year on their energy bills, and employs more Americans than coal — in jobs that pay better than average. We’re taking steps to give homeowners the freedom to generate and store their own energy — something environmentalists and Tea Partiers have teamed up to support. Meanwhile, we’ve cut our imports of foreign oil by nearly sixty percent, and cut carbon pollution more than any other country on Earth. 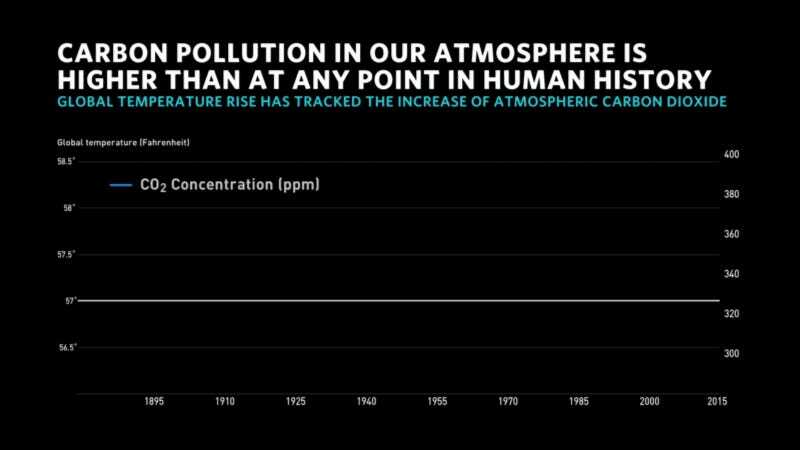 Now we’ve got to accelerate the transition away from dirty energy. Rather than subsidize the past, we should invest in the future — especially in communities that rely on fossil fuels. That’s why I’m going to push to change the way we manage our oil and coal resources, so that they better reflect the costs they impose on taxpayers and our planet. That way, we put money back into those communities and put tens of thousands of Americans to work building a 21st century transportation system. None of this will happen overnight, and yes, there are plenty of entrenched interests who want to protect the status quo. But the jobs we’ll create, the money we’ll save, and the planet we’ll preserve — that’s the kind of future our kids and grandkids deserve. Back in 2011, President Obama called to have one million plug-in electric cars on the road by 2015, but we had barely even reached a quarter of that proposition when 2015 came rolling around. Of course there were quite a few roadblocks, including gas prices plummeting, and Congressional denial to Obama’s proposed $10,000 point-of-sale tax rebate on EVs and desired investment in waning off U.S. consumers from foreign oil. President Obama’s points on building a 21st century transportation infrastructure comes just days after Secretary of Transportation Anthony Foxx announced that his department of the government had no plans for developing federal regulations for autonomous vehicles — which is incredibly alarming considering the Due By date for most automakers developing said technologies is 2020. According to Reuters, the same Anthony Foxx is headed to Detroit to back up the President’s outlook on the future of American transportation and speak with the key members of the automotive industry on Thursday, likely at the Detroit Auto Show. Foxx is expected to talk about the Obama Administration’s efforts to speed up the introduction of self-driving cars, and hopefully confront the looming concern over a lack of federal framework governing autonomy in America. Meanwhile, the head of the National Highway Traffic Safety Administration (NHTSA) Mark Rosekind has publicly denounced the slowly emerging “patchwork” of State laws and regulations concerning autonomous vehicles rather than a Federal standard, and has assured a “flexible” approach to outlining a legal framework concerning the emerging technology is coming. We don’t yet know exactly what Obama’s plans for a modern transportation system look like, but it undoubtedly will include the advancement of electric, hybrid, and autonomous technologies, affordability and accessibility of these products, and hopefully some sort of legal framework and standardization to what is required of automakers and other companies when the cars and transportation methods of the future go into production. Congress recently passed a $305 billion bill investing in the development of infrastructure nationwide, as well as opening up the Strategic Oil Reserve, a move which follows Obama’s sentiments tonight on limiting the influence of foreign oil. However, the effects of this bill raise major strategic and financial concerns in the event of another economic crisis. The President’s running theme for tonight’s speech was focused on the spirit of innovation, and the automotive industry hasn’t been as innovative as it is now since Ford developed the production line. There’s no doubt any plans affecting the future of America’s economy, infrastructure, and energy use will involve automotive innovations like electric, hybrid-electric, and autonomous technologies. Obama was sure to highlight the importance of American innovation, companies like Ford, Google/Alphabet, Tesla, Uber, Lyft, and General Motors developing innovations to the market and infrastructure systems is exactly what a 21st century transportation system will require. Now the biggest challenge to our future is the willingness of legislators to encourage and develop a framework that allows America to innovate. You can read the full State of the Union address here. PHOTO: Getty Images, with chart information provided by The White House.